Four students from three colleges and universities presented papers during the Eta Sigma Phi national conference hosted at Dickinson College. 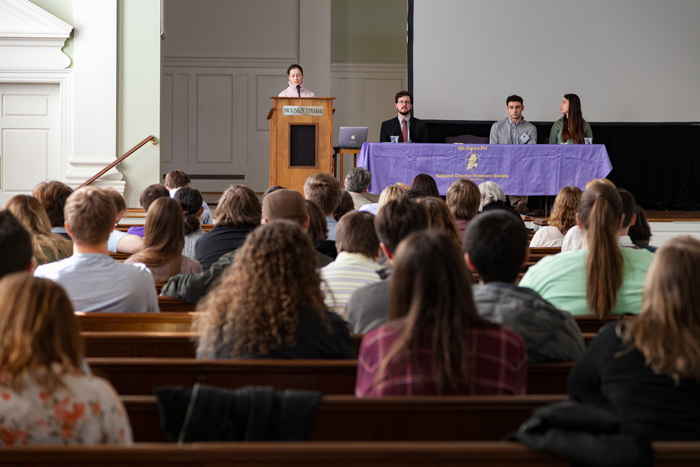 Dickinson College’s Department of Classical Studies recently explored everything from the Hercules cycle to Caesar and the Battle of Alesia during the national conference of the Eta Sigma Phi classics honor society. Hosted on campus—and attended by nearly 100 undergraduates and 15 faculty members from across the country—the three-day annual conference featured competitions, presentations and an exploration of the Trout Gallery‘s classical collections. In her opening remarks, President Margee Ensign posited that the vast growth in classical scholarship over the past half century is a sign of the strength of the liberal arts as well as the foundation upon which Dickinson was built. Rounding out the activities were a Latin declamation contest, a vase-painting workshop led by Assistant Professor of Art and Art History Rachel Eng, lectures on Caesar and the Battle of Alesia as well as mythology’s connections to astronomy and a presentation of some of the “classical treasures” in the Trout Gallery’s collections—including a chunk of the Parthenon and a denarius of Septimius Severus.